PARIS: Moussa Dembele grabbed a stoppage-time winner for Lyon in a 2-1 victory over bitter foes Saint-Etienne on Sunday, while Marseille snapped a wretched run of nine games without a win as they beat Caen 1-0 in Ligue 1. Romain Hamouma headed Saint-Etienne into the lead on 21 minutes at the Stade Geoffroy Guichard, but Nabil Fekir converted a second-half penalty to haul Lyon level following a handball by Loic Perrin. An unmarked Dembele headed over in the dying stages after coming on as a substitute, but the forward made no mistake with another chance moments later to floor the hosts in the 95th minute. “We do this job for this kind of feeling,” said Lyon coach Bruno Genesio. “It was an excellent derby. Both teams got properly into it.” Lyon goalkeeper Anthony Lopes had earlier pulled off a stunning triple save to keep the visitors in the game, twice denying the in-form Wahbi Khazri before tipping away Hamouma’s follow-up. A pitch invasion by angry home fans caused a lengthy stoppage when Lyon won 5-0 last season, and tempers again briefly threatened to boil over following the final whistle on Sunday. 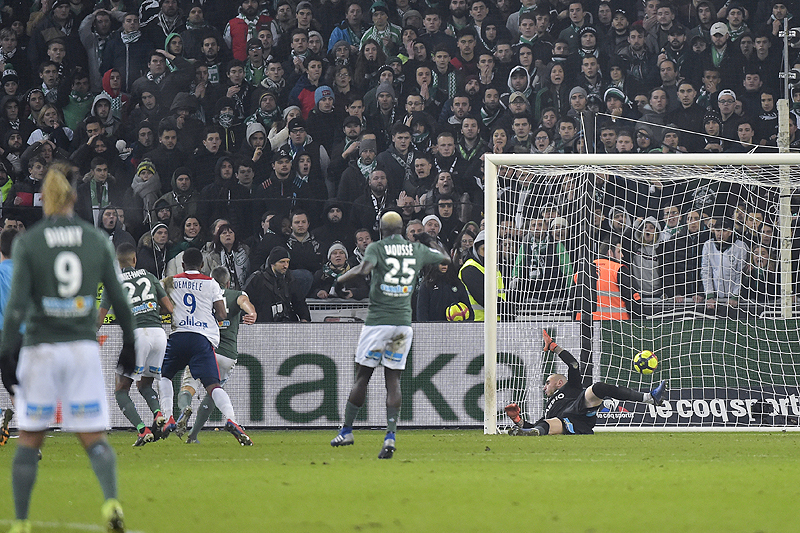 Lyon climbed back above their rivals into third place after dealing Saint-Etienne a first home loss of the season. Earlier, Marseille recorded a first win since late November despite losing the influential Dimitri Payet to a knee injury after just 24 minutes. Morgan Sanson, on as a substitute for Payet, guided home a header from a Kevin Strootman cross two minutes after the interval to earn Marseille a welcome three points. Caen played most of the second half with 10 men after Frederic Guilbert was dismissed for a second booking. Marseille had faced angry supporters in heated exchanges following last weekend’s 1-1 home draw with Monaco, the culmination of a dismal run that included a humiliating French Cup defeat by fourth-tier amateurs Andrezieux at the start of the month. “I’m not relieved. I’m happy for the players because it confirms the good things we’d done in the last two matches against Monaco and Saint-Etienne,” said Marseille coach Rudi Garcia, who again faced calls to resign from Marseille fans in the away section. He also provided an update on Payet, saying he was unsure whether he would be available for next week’s visit of Lille. “I don’t know. It’s never good when it’s the knee,” said Garcia. “He felt it all of a sudden… I think it was a Caen player who fell on top of him, or something like that, when he was on the ground.” Marseille moved up to seventh and to within six points of the Champions League spots after inflicting a fifth home defeat in six outings on a Caen outfit with just three wins all season. Kylian Mbappe and Edinson Cavani both scored hat-tricks on Saturday as Paris Saint-Germain romped to their biggest-ever home win with a 9-0 thrashing of bottom side Guingamp.